What I do on Mondays! the velvet hat phase always looks cute, nice snap. 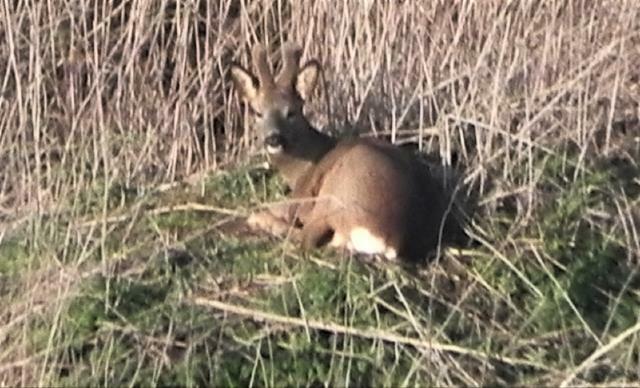 Nice picture Buzzy, but in my experience, roe bucks are cheeky so and sos and won't be particularly bothered by humans. I had to walk determinedly towards one once to stop it chewing the coppice. A pleasant walk round some flooded gravel pits today, despite the wind. Some parts were sheltered and warm in the sun. We saw assorted birds - ducks of various types, and Black Headed and Common Gulls. A squawking Pheasant drew our attention to the far bank, where one of us soon spotted a Fox prowling about in the undergrowth. We later heard a Chiff Chaff and in the wildflower line we saw Coltsfoot, White Violets and Celandines ( as well as Daisies and Dandelions!). 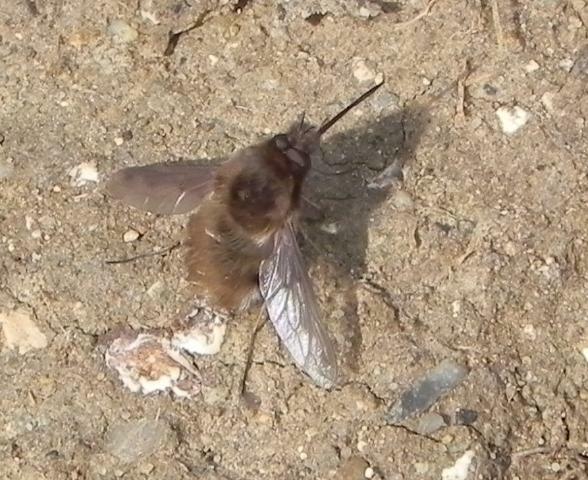 Against a heap of earth was a notice describing how it had been placed there as a nesting site for solitary bees, and sitting (standing) on the side of the heap were one or two Bee Flies (Bombylius major) which lay their eggs in the nests of solitary bees. They appeared to be standing upright, trying to get the most advantage of the sun's warmth, I presume. They seemed quite oblivious of photographers. That's a furry looking fly. Good picture though. look after the zebras and wildebeests, the lions will look after themselves. perhaps the " predator " is one of the best canaries in the mine as to how it's "prey" is doing. for instance quite a few of us round here provide food, shelter etc to small birds. the peregrines seem to approve our work during the hungry months. hey ho that is an ecosystem and a ecosystem with a fairly rare class 4 predator presence . Nice picture Henry. Sounds like a good walk. Working in the coppice coup, we have now found a lot of primroses, some barren strawberry and the odd wood spurge in flower. Have found 2 celandines in flower in the woods, but more up the lane leading there. Glad to say plenty of bird life too, including a pair of tawny owls, which seem to have paired up. Reading the Big Book of Bee Flies, I learn that this species doesn't like to fly when the temperature is below about 17 degrees C, and will happily stand like the one in my picture, vertically, sometimes remaining completely immobile for as long as a week! You would think with habits like that they would be predated by birds etc. and die out. Nature is very quirky. A danger for a lot of things. People who walk in our woods say they have never seen any deer; well they won't if their dog is ranging ahead of them, sometimes in the next wood, scaring them away. considering her background Ki was rather deferant to me re deer, a few times we got pretty close with her being very stealth and then we sneak away. i know she could have so easily if she had been given permission. full blood are ace but asking "well, is it ok? " and acting on the response is a bit delux . many mutts will do their best without asking even if their person might or might not approve or whether or not they have any chance of bringing home the venison. i don't do such things but if i did chompski as a pup would have been a good candidate for a deer hound. considering chompski can amble up to a bunny, say hello and amble off again i don't think deer would have a problem/chance depending how he was directed. Very few dogs will actually bring down a deer, but we are getting to the time of year when the does will be having fawns. A dog chasing a heavily pregnant doe can result in a still or early birth, and once the doe has the fawn it will defend it. There was a case not far from us where a dog went for a fallow fawn and was killed by the doe. Owner couldn't do a thing about it as the dog was off the lead and ranging away from owner and out of control.